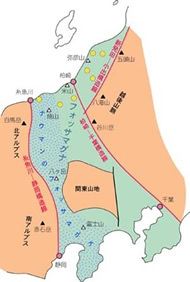 The Itoigawa-Shizuoka Tectonic Line, which separates Japan into eastern and western halves, runs along the western border of Fossa Magna. The fault line mostly follows the path of the Himekawa River, but between Negoya and Kitaotari it runs along the mountains just east of the river. The area along this fault produced many landslides and topographical basins, resulting in the area's gentle slope seen today. It was by connecting these basins and gentle-sloping areas that the Salt Trail was created. Construction of the road was not without peril, though, as the Himekawa River often floods and landslides are fairly common. Along this road, various goods from the sea were transported from Niigata to Nagano and exchanged for products like tobacco and cereal grains. One area along the road is known by the name of 'Utou.' The slope here is not natural; rather, it was excavated by the early roadworkers to permit easier travel. In addition to the ruins of old teahouses and guideposts, one can find the remains of an old trade road here. 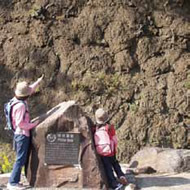 At nearby Fossa Magna Park, one can observe the Itoigawa-Shizuoka Tectonic Line, outcrops, and pillow lava as well as learn about the formation of Fossa Magna. 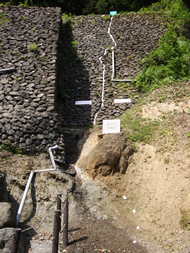 The Fossa Magna Park, located within this geosite, offers visitors an opportunity to inspect an artificially exposed section of the fault along the Itoigawa-Shizuoka Tectonic Line which sep-arates the Japanese islands between the Eurasian and North American continental plates. The stone on the eastern (right) side of the fault is 16 million years old, but the stone on the western (left) side of the fault is 400 million years old! The Himekawa River has long had a reputation for flooding, landslides, and other disasters, and so forging a road through the gorge proved dangerous. For that reason, a trail was made through the mountains where the fault produced relatively gentle terrain. Within this geosite are well-preserved sections of this ancient mountain trail including stone buddhas, guideposts, and the sites of former teahouses and inns. Pillow Lava is a form of lava that is typical of underwater volcanoes. It is formed when lava flowing underwater is extruded into piles of tube-like shapes. 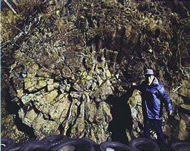 The strata located above this pillow lava contain the fossils of marine bivalves, indicating that this area was once at the bottom of the sea. Utou is the local name given to the U-shaped paths excavated through the mountains along The Salt Trail. 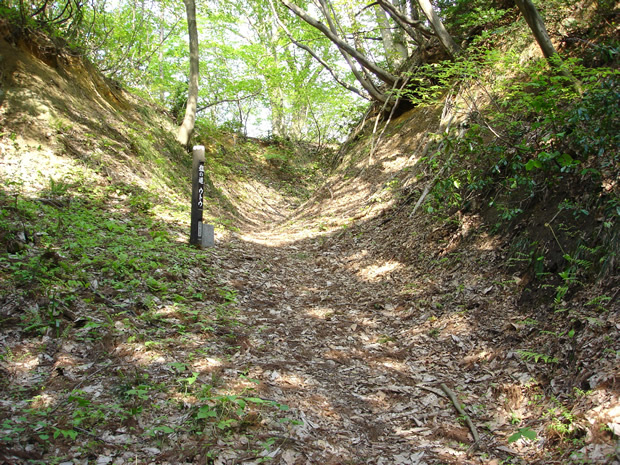 The Utou in the Ono area is particularly well-preserved and is a famous spot along the Salt Trail popular with hikers. Fossa Magna means "great ditch" in Latin. It was discovered and named by the German geologist Dr. Naumann during the late 19th century. It is a large band which stretches across the middle of Japan's main island of Honshu. This region was once part of a sea and has a younger geological age than the rest of the island. Along the walkway in Fossa Magna Park, you can see a massive wheel-shaped rock formation. This is actually a large, single pillow lava tube and is among the largest such formations in Japan. Kanpa is a local term for a variety of skin diseases that can affect children, particularly rashes on and around the head. This statue has long been prayed to as a means of warding off these ailments.